Hello everyone, I wish you all a happy Friday and amazing weekend. Today is the last day of the week and I'm excited because I will have time to read blogs on the weekend and explore amazing posts. Also, my favorite time to watch some movies and spend time with family and friends together. I've started connecting with bloggers and it's just amazing how the blogging community does have amazing people all over the world. This was one of the goals I've sat in the last year and I'm excited to meet more bloggers and create such a good friendship and work with them. Today I'm going to do one of the posts that I've planned for this month and it's not new, but I've never thought of blogging it before. I thought it will be a good idea to share with you this kind of stuff and hopefully, you will enjoy reading it because whenever I start something new on the blog I'm not sure if it will be interesting for you or not. Something about me that I don't like to talk about the things because it's not interesting and there are millions of people already done it, but I like to talk about some things related to whatever I want to talk about. For example, I have the outfits talk and I don't talk about the outfits, but I talk about topics related to it. 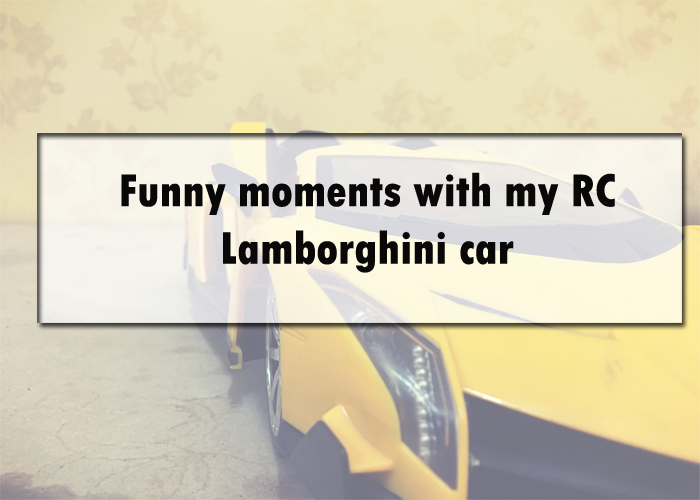 When I was going through my collections, I found that I have a lot of RC's and an amazing idea came to my mind and this is what this post going to be about. I'm going to include an RC truck or car each post and mention some of the funny moments and good moments that happened while using it. Also, I will do stunts and other amazing stuff and blog it. I would like to talk about my history with the RC trucks and cars before I start this post. I started getting RC's back when I was in my first days of school. My uncle would buy me an RC truck or a car when I get good grades and of course, I was the best student in my school and my uncle would buy me one every time. I had no experience first when I got and I would play with my cousins and crash it, but what I like about RC trucks, is that they don't get destroyed easily which is the best thing for people like me who don't know how to drive good. My mom knew that I was enjoying RC's and then she decided to buy me an RC for my birthday. This is how my relationship with RC's started to grow up and love playing it more. I have collected some of them and some of them did not last till this moment which is fine because always hold tight on things you have rather than thinking of what it has been lost. I have been a fan of RC's since I was a kid and I don't think it will fade away because always enjoy playing them. There is always a funny thing happen when playing it and I think it will be interesting to share it with you. Anyway, I'm going to start off this post and talk about my first RC car in the collection. 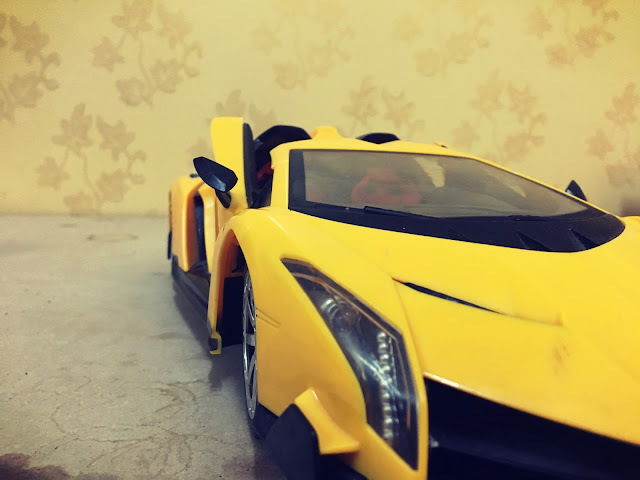 We are going to start fancy and I'm going to share my RC Lamborghini car. This is a recent car that my mom bought it for me when she traveled and wanted it as a surprise. It's super fast and the lights turn on as you drive faster which is amazing especially when I driving in the dark which give it more epic look. The first moment, I wasn't really planning on doing this, but when I was playing with the RC car, I saw my cousins sitting and talking to each other and there is a wall which helped me to sneak closer to them. They didn't notice me and I put my car down and drove it fast toward them at full speed and they got a little bit scared, haha, but still, I got them. I think they it could be scarier, but I didn't do it the right way because I was kinda nervous due to the sneaking process haha. The second moment, I was racing with my cousin and he had a red RC truck and my car was faster but then I got distracted and crashed into a bush. My cousin kept laughing at me because of my stupid crash and he forgets that he is not a good driver and he crashed into the food table. The race track had a food table where we were eating on and got all the food on the ground. I'm not going to lie, I'm not that professional on driving the RC's and I'm still learning because when it gets faster, it's hard to control. The last moment, my little brother was playing with the car's wheels after he flipped it over and suddenly, I boost it with gas and he freaked out haha. He had a good reaction to this and got mad at me for scaring him, but I didn't capture it because I haven't thought of blogging it before. When little brother playing with an RC car silently and all of sudden, the wheels started moving and the sounds, I think it could be scary, haha and I don't blame my little brother for his reaction though. There is a lot of moments and memories with this car, but I think we are going to do three moments for this post because I would like to see how it will do. I'm going to figure out a way to share photos of these moments soon because I have no idea how to share them or capture them. I would like to know what you guys think of this idea and comment your thoughts about it and By the way, before I end the post, I would like to announce that we are taking the feedback feature at the bottom of each post off. Also, I'm working on a new update for the blog as I said in my previous post and it will be done soon. Never played much with RC cars or trucks, but looks like fun for any kid! Enjoy your car! That's funny! I've never played with RC cars before but the one featured looks cool! Haha! Sounds like you had a blast! That car is pretty great looking! Sounds like you've had some fun moments with it so far! Too fun! I never had RC cars growing up much (even with my dad being a race car driver) but both of my boys have ones that they have fun playing with. What a fun idea for a post! My sons would love to play with cars like this. That is so much fun! My brother and I would play with RC cars growing up and they were so much fun! How fun. I'm not really much of a "car person" so I have nothing witty to add about cars, but I enjoyed reading your thoughts!! I've never played with RC cars, but my husband has and he enjoyed them. I bought him a '57 Chevy, but he enjoys racing his real '66 Fairlane more. Never played with RC cars. But I think my brother will enjoy this a lot. Looks very fun and interesting. Great post , thanks for sharing your views! I was so crazy about RC cars when I was kid, but my dad never afforded to buy me one. So now when my boy asked me to buy him RC, I right away got him along to the store. 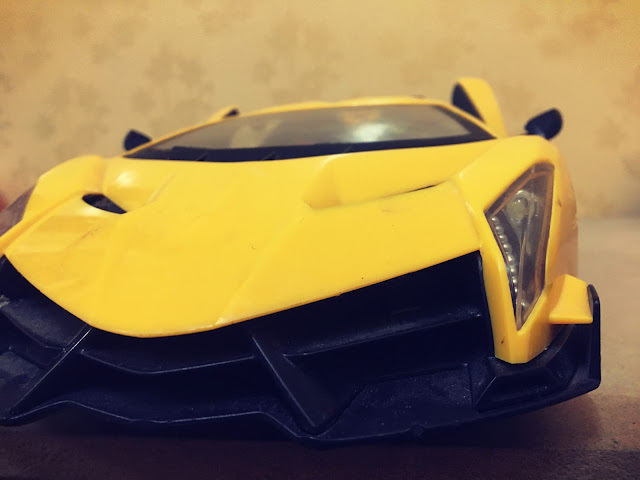 I'm not interested in it now, but at least I can see a throwback in my boy's craziness now..
Well I think its a pretty cool idea, and I like your Lamborghini! Your mom must be a special lady to get you such a cool gift! Awesome story and entertaining! First I’ve heard of it but it looks like a fancy collectible. Seems like an amazing gift. I also agree that the blogging groups are great for connecting with bloggers all over the world. What a fun write-up! Felt really good reading it! 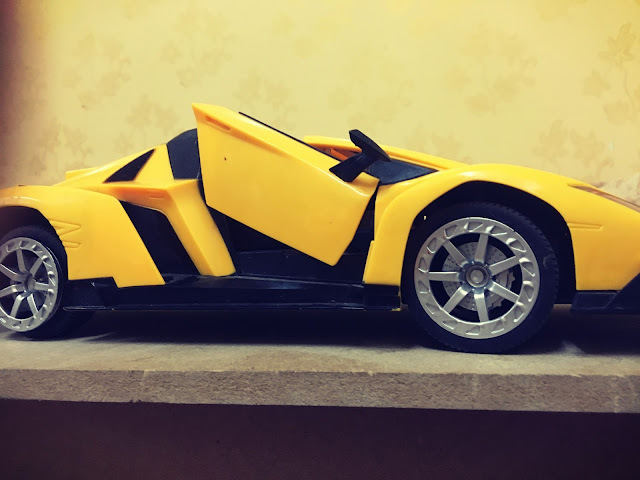 Being one of five girls and no boys in my family, I had no idea what an RC car was before reading this post. Now, I feel like I need one for my thirty year old self. I totally missed out!